When I was in high school, the year between junior and senior year, I had a job scooping ice cream at an ice cream shop on old West Berlin's main drag, the Kurfürstendamm. Did you know that Germans eat more ice cream than, well, most people? I scooped - and tasted - a lot of ice cream that summer. So much so that for about a decade afterwards, I couldn't even smell ice cream without feeling slightly nauseous. This summer, as we race through the final recipe testing before the manuscript for the German baking book is due, is shaping up to be the same kind of summer. The fug of butter and sugar that hangs in the air every other day here - once so cozy and wonderful a scent! - is making me want to run for the hills. But I cannot run! Baking is my duty! So instead, I cook up green and leafy lunches for Maja, my incredible co-baker, and me on testing days, and I take refuge in cold and salty drinks, which feel like the only thing quenching my thirst right now. I buy sauerkraut juice at my local discount grocery store (no joke - if you're a pickle juice lover, THIS IS EVERYTHING). I am planning a weekly gazpacho production cycle for as long as it stays hot and the oven is on. I'm still heavily into shrubs, inspired by one of my Harper's Bazaar columns from the spring. And then there's ayran: cool, creamy and refreshing ayran. Ayran, a salted and sparkling Turkish yogurt beverage, is available on almost every street corner in Berlin, which boasts the largest Turkish community in the world outside of Turkey. But it's a cinch to make your own ayran at home - you simply mix a few spoonfuls of yogurt with a bit of salt and water (I like sparkling, which has the added benefit of making the drink foamy, but you can use still) and, if you like, a pinch of mint for some added zhuzz. I have really fragrant dried mint that works beautifully in ayran, but right now I'm really loving the very pure, clean flavor of plain ayran. I got the inspiration for making ayran at home from Janet Fletcher's new book, Yogurt, which was recently published by Ten Speed Press. It's a slim little book packed with easy recipes that I want to subsist on all summer long, like tomato and bulgur soup with yogurt, and grated carrot and cumin salad with yogurt, and Turkish-spiced green beans with, wait for it, yogurt. In fact, I've earmarked almost every page in the chapters on soups, salads, and vegetables. Oh, and the one for "Lamb Meatballs in Warm Yogurt Sauce with Sizzling Red-Pepper Butter." Because lamb meatballs! In warm yogurt sauce! With sizzling red-pepper butter! I mean, really. But first, back to baking. Honeyed gingerbread, to be exact. Ayran in hand. Note: The author calls for drained or Greek yogurt. I used regular whole-milk yogurt, which is very smooth and creamy here in Germany, and it worked beautifully, but if you can't find such creamy yogurt to start with, you should probably follow Fletcher's recommendation. 1. Place the yogurt in a glass. Whisk in just enough water to thin the yogurt to the consistency of buttermilk. A word of caution: if using sparkling water, the foam will rise quite quickly. Whisk in salt to taste. Add ice cubes, if desired. Drink. Before we left (at which point Hugo cried, just like I always did when I was little and it was time to leave Joanie's), Joanie grabbed one of her many baskets, lined it with paper and went out behind the garage to the enormous elderflower bush growing there to snip off a bunch of heads for me. I snapped a picture of the beautiful flowers for Instagram and then Abbey asked me to blog about making elderflower cordial and hey presto here we are. I aim to please! 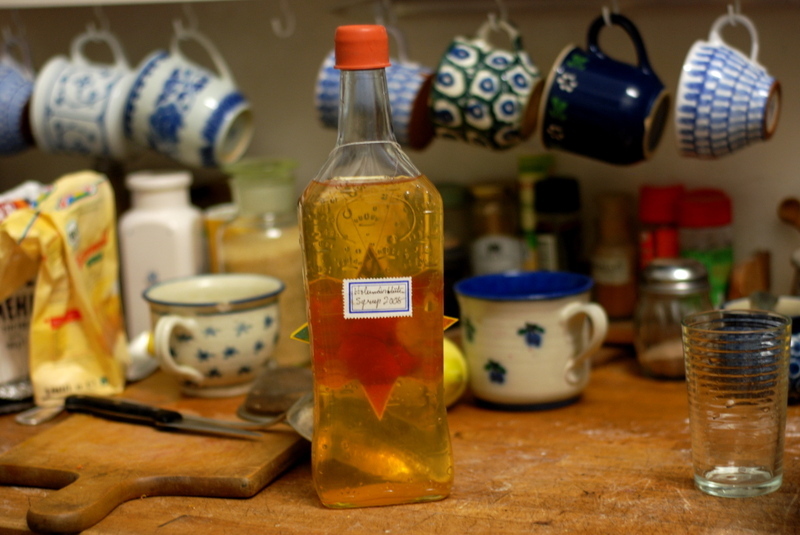 Elderflower cordial is one of those things that seems impossibly complicated from afar, but in practice is silly easy. Though I do have to qualify that by saying that it is, of course, only easy if you have access to elderflower bushes (and preferably ones not lining a major roadway). If you don't, my apologies. But if you're one of the lucky people that have them growing in your local parks or backyards, then elderflower cordial is ridiculously easy and so delicious that it should go on your to-do list right now. Okay, so the first requirement is a flowering elderflower bush that is not contaminated with exhaust. Got that? Great! Next, make sure that the bush hasn't been rained on in the past few days. Now get yourself a basket, line it with paper towels or a piece of Kraft paper and grab a pair of clippers. At the bush, hold the basket underneath each head of flowers and snip the head directly into the basket. You'll want about 25 heads. The pollen in the tiny elderflower blossoms is what makes the cordial so delicious and fragrant, which is why you don't want to lose any of it. Once that's done, go home and find yourself a big old crock. Make sure it's clean. Holding each elderflower head over the crock, carefully snip the tiny blossoms into the crock. Do not wash the elderflowers before doing this! (This is why I told you earlier that exhaust-free flowers are essential.) If there are any bugs, try to pick them off before doing your snipping. Discard the flower stalks. Shake whatever pollen gathered on the paper lining into the crock as well. Next, gather up three or four organic lemons. Slice them thinly using a very sharp knife and add the lemon slices to the crock. Put 1 kilo of sugar (this is equivalent to 2.2 pounds) in a big pot on the stove and add 1.5 liters of water (6 cups of water). Turn the heat up high, stir to dissolve the sugar and bring the mixture to a boil. Let it cool slightly, then pour the hot syrup over the elderflowers and lemon slices in the crock. Cover tightly with a piece of plastic wrap and put somewhere cool for a minimum of three and a maximum of five days. Stir the mixture once a day. When the mixture is finished steeping, put a big pot on the stove and balance a sieve over the pot. Pour the contents of the crock into the sieve and let them drain well. (Do not press down on the lemons and elderflowers, though.) Add 3 tablespoons of citric acid (also known as lemon salt or sour salt in Indian grocery stores) to the pot and then bring to a brief boil before taking the pot off the stove. To me, elderflower cordial mixed with cold water tastes like the essence of summer (and other things, but you'll have to read my book for them) and I rarely have any of it left by the time the days shorten and get cold again. So go out while the picking's good and make hay while the sun shines. In other news, I'm thrilled to be a speaker at the Food Blogger Connect conference in London in a few weeks! I'll be speaking about the transition from blogging to book-writing, and will be taking part in the panel about the business of cookbook publishing in general. The full-weekend passes are sold out, but you can still buy tickets to the conference for individual days. I'm speaking on Saturday and will be on the cookbook panel on Sunday. I'll also be signing books. If you are going to be there, please come and say hi! This will be a very quick dispatch indeed, frustratingly quick, I'm afraid, because - people, this is big - I have tasted manna and I have no recipe for you and I can only hope you're all very distracted with Christmas plans and travel itineraries and far more important things than checking in with me here so that you won't entirely hate me once I tell you about this elixir and how we all not only have to wait for summer to make it ourselves, but source ourselves an elderberry bush, which as you might know is not so easy at all, no sirree, Bob. I was at Joan's the other night, for the Springerle bake-off (more on that soon, I promise), when she innocently asked me if I wanted a cool drink. With her Holundersyrup, to be exact. Holunder is the German word for elderberry (and, more importantly, elderflower) and seeing as my mother, a very accomplished preserver, to be fair, was the source of some pretty gnarly elderberry preserves a few years ago, I wrinkled my nose (politely!) and said I'd try a small sip. You know, to be gracious. Well. Well. Yes. Let me try to explain what happened next. I took a sip of cool tap water that Joan had mixed with a spoonful of the golden syrup. And suddenly, like a gentle thunderclap or a small fissure in the space-time continuum, I was transported. Summer, Berlin summer, was in my mouth! How odd. I stood in the kitchen, the wintry scent of cinnamon hanging lightly in the air, candles aglow and darkness swirling about outside - all hallmarks of Christmas in Berlin - and yet there I was, with summer in my mouth. Birds chirping, warm breezes blowing, blooming branches dropping petals on the sidewalk. It was all quite marvelous. After all, I haven't been to Berlin in the summer since 2001 and to say I've missed it would be the understatement of the decade. So, now to explain to those souls out there who don't know the beauty that is summer in Berlin (seriously, dear readers, gas prices are plummeting, no one's traveling - book yourselves a flight already): elderflower syrup is fruity and sweet and cooling and refreshing, incredibly so, yet not cloying like rose water, even though it is floral. It's cool floral, not florid floral. Know what I mean? Am I making any sense? Should I shut up already? Just take it from me: elderfloral syrup is an absolute dream. I don't have an exact recipe right now, though apparently Joan found one on the internet that she improvised with. Next summer, I promise, I'll make this in Italy, where we have lots of elderberry bushes growing wild, and I'll give you exact proportions. But, roughly speaking, here's what you do: get yourselves a whole mess of elderflower blossoms, some sugar, lemons, citric acid and a bit of water. Put it all in a crock (earthenware, I guess) and cover it and let it macerate in the dark for four days. Strain it and voila! Wait, that doesn't sound right. Maybe you let the elderflower blossoms and the citric acid and the lemon juice macerate for a few days and then you make a simple syrup with the sugar and water and then you mix it together with the strained elderflower liquid, and then voila! Hmm. I don't know. But what I do know is that, man, I can't wait to have more of that stuff. And that I'm so happy to be here right now that I'd like time to stop. That's all.